One of the most common issues in photography is a blurred image that is otherwise perfect for your needs. There are two options for fixing your photo before you run out and reshoot: the Sharpen tool or a filter. Either one can help you bring definition and focus to your image. 1. Using the sharpen tool in Photoshop, you can easily increase your picture's definition reducing the blur. Open your sharpen tool. Select in your photo what you'd like to bring into better focus. 2. You can sharpen the entire picture by using the filter open in your main menu. Simply click in the main menu, select Filter, then click on sharpen. Remember that this doesn't allow you to choose specific parts of your picture. It sharpens the entire photo. Another common issue can be under or over exposing parts, but not the entire, picture. This tool takes care of that very easily. Rather than adjusting the exposure for the entire photo which could then throw off other parts, this tool allows you to select which underexposed areas you'd like to brighten. Choose your Dodge tool and sweep it across the underexposed part. Instant brightening! If your picture is askew or not at the angle you'd hoped it would be, you can straighten it out using the straighten and crop tool. Use the arrows that appear when you use the tool to rotate your image as you like. Once you have straightened out your image, you can also use the tool to crop off the edges created by the straightening of the image. You don't have to settle for a standard shape when it comes to your photos. (Think round profile picture). If you know how to use the Marquee/Elliptical tool in Photoshop, you too can create any shape you want to meet your needs or your creativity. You can have some fun with varying shapes whether it's a circle, a triangle or any shape you can draw using this tool. Your only limitation is your imagination. 1. 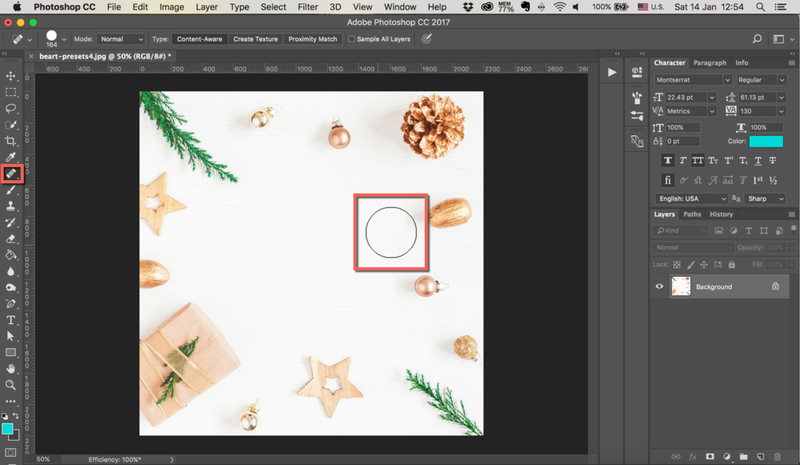 Open your image and make sure your Layers Panel also is open because you'll be using it. 2. Select your Marquee tool and right click for the Elliptical Marquee. 3. Using the tool, highlight the area of the photo you'd like to include in your circle. You can adjust the circle's diameter using the tool. 4. When you see the dotted outline of the circular area, right-click to create a new layer. 5. Click on the "eye icon" by the Background to make it invisible leaving only your circle visible! If you need to, you can straighten your image and crop any edges by going back to your Straighten tool as explained above. Sometimes, it's a tiny spot - or two - on your image that ruins the entire thing. The Spot Healing brush is the ideal tool for this minor task. Using the tool, choose the size of your brush to match the size of the spot, and click on the blemish to "heal." Just like that, it disappears! You can repeat these steps for one or more spots in your image. You adjust the size of your brush each time to the size of the speck to accurately remove it. So, before you go and retake a good, but not perfect, picture, try Photoshop. Give it a go and have some fun with it. With a little experimenting, you can easily make any necessary adjustments or fixes to your photos.